I was amazed yesterday God really demonstrated how He uses banners to minister to people. 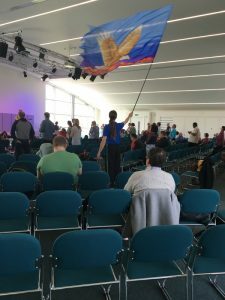 I was moving in the worship at a leaders conference and felt lead to use a banner with an eagle on it, although it did not particularly fit with the song that was being sung. There was not particular shift so I thought well maybe there is just one or two people that it was meant for or maybe I was wrong and there was no significance in using that banner. I was just putting the banner away when someone started sharing about how the eagle had really spoken to him and shared a prophetic word about how the eagle is powerful in the sky but how useless a snake is in the sky. He shared a story that God has lead him to share. It picks it up into the sky and changes the battle ground, and then it releases the snake into the sky. The snake has no stamina, no power and no balance in the air. It is useless, weak and vulnerable unlike on the ground where it is powerful wise and deadly. Take your fight into the spiritual realm by praying and when you are in the spiritual realm God takes over your battles. Don’t fight the enemy in his comfort zone, change the battle grounds like the Eagle and let God take charge through your earnest prayer. This lead to God taking the worship in a new direction and speaking to people about praying into situations. I felt so privileged to have had an affect on what was going on and lead people into a new encounter with their Heavenly Father. The whole encounter reminded me that you can’t always see what God is doing. I knew which banner to use but I then started to loose confidence cos nothing visibly happened but God was using me to minister I just didn’t know it. I want to encourage you that if you are obedient to God, He will use you to minister to others in amazing ways! Even if you can’t see what is going on.